When I bought a skein of deliciously soft fall-themed yarn, I knew I had to use it–even if it was still feeling more like summer than autumn. With that in mind, I decided to go for something open and airy that I could later bunch up for warmth when the weather turns. So I decided to turn to letters that come in toward the end of the alphabet– Y, X, and V–to create a pattern that fit my needs. The pattern is easily changed if you like a wider or longer scarf. Repeat rows 2 – 22, 2 more times. Finish off. 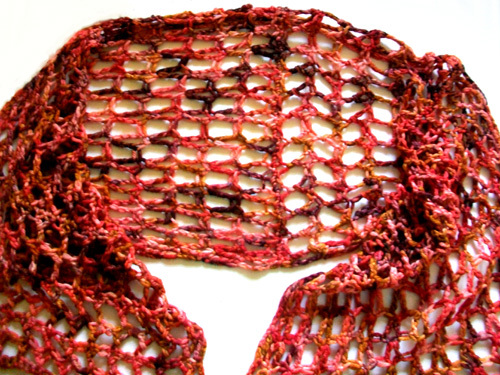 You may want to use pins when blocking to make sure the stitches retain their shape. This entry was posted on Tuesday, October 31st, 2017 at 12:00 AM by Candace	and is filed under Free Crochet Patterns. You can follow any responses to this entry through the RSS 2.0 feed. You can skip to the end and leave a response. Pinging is currently not allowed. Do You Say Treble or Triple Crochet? I often find it fun to do mesh-like stitches. Thanks for these interesting variations! Any one of them would make a great lacy scarf, or even market-type bag.